Flicking through an abandoned magazine in an airport last week, I stumbled across an article dissecting the peculiar strain of madness thought to run through David Bowie’s family. It featured a black-and-white photograph of Bowie himself—who died of cancer in January—when he was seven. This young David is slightly turned toward the camera in an asymmetric pose, pulling a smile upstaged by his signature magnetic, almost eerie (if not alienish already) eyes. It’s the face of a precocious kid from a middle-class family, and yet, it is quite possible to catch a prophetic glimpse of the person who’s going to change the face of pop culture forever (and who will nurse the cultural literacy of generations of singers, artists, and writers, myself included). The article fresh in my mind, a few days later I found myself in Hong Kong for the opening of Massimo De Carlo’s first Asian space—his third venue after Milan in 1987 and London in 2009—where he presented a solo show by the Chinese-born, France-based artist Yan Pei-Ming, It Takes a Lifetime to Become Young. The exhibition featured a new body of work in which the artist’s signature fast-stroke paintings depict a selection of artists who inspired him, portrayed in the early years of their lives. There’s Lucian Freud as a schoolboy in shorts, smiling with a schoolbag on his shoulders; a barefooted five-year-old Jackson Pollock feeding ducks and hens; and an ethereal baby Frida Kahlo in a slouched sitting position. The contrast between the reverse–crystal ball effect of the magazine image of the young Bowie (in which one could all too easily project the familiar representation of the future icon onto the look of his younger self) and Ming’s paintings (where faces are—as is everything else on the painterly surface—in constant agitation, animated by muscular and thick brushstrokes) was stark. In Ming’s new works it can actually be hard to tell who’s who without a caption list: the images of the master painters in their boyhood are fuzzy and ambiguous, eerily nonspecific. Quite a change compared to many of Yan Pei-Ming’s other portraits, where the subjects are often faces we know all too well: Mao Zedong when chairman of the People’s Republic of China, Karol Wojtyła as Pope John Paul II, George Washington on the $1 bill. The Chinese painter is known for addressing the power of the image through household images of power. 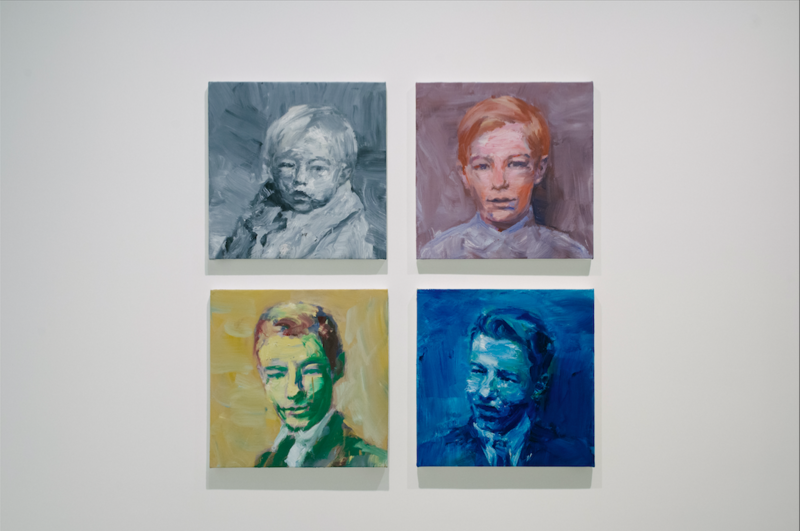 While several of his previous works employed repetition or juxtaposition (like US President Obama’s portrait rubbing against that of defeated presidential contender John McCain) to challenge conventionally accepted identities, this new series strips authoritative, influential figures, such as Pablo Picasso or Willem de Kooning, of their authority and weight, rendering them fleeting, vulnerable—undone. Furthermore, by revealing historical figures in their previous, undetermined childlike state, Yan Pei-Ming manages to make them human again. Take for example the installation of four medium-size paintings depicting Andy Warhol at different ages in passport photo style: there’s a baby Warhol in a gray palette; a slightly older boy, probably around five, in rusty pink; a more colorful and nuanced portrait of the artist at about ten; and finally an all-blue version of Warhol as an average-looking teen. Seen together, the pieces possess a melancholy, candid, soulful, and somewhat playful edge: it’s a Bildungsroman in painting form. One is left wondering whether Yan Pei-Ming aimed at out-WarholingWarhol by this comprehensive stripping of the individual greatness from a famous individual by making their image universal, or whether the artist rather wished to celebrate the genuineness, the authenticity, the truthfulness of those who inspired him and his practice. The question is further complicated by the inclusion in the exhibition of a self-portrait depicting Yan Pei-Ming as he is today. Whether it is an improbable self-elevation to power or an exercise in humility (him as an infant compared to master painters) is hard to tell, and perhaps the answer will be revealed by the direction in which his incessantly researched painting further evolves. The fact that he’s slowly abandoning his signature monochrome palette in favor of an array of different and vibrant tints and shades signals a shift that will be interesting to see unfold.